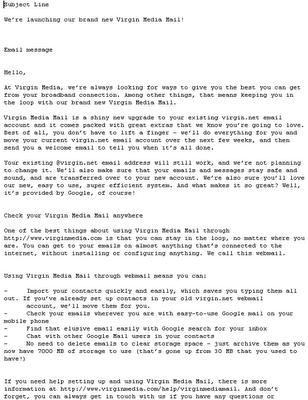 There's a big couple of weeks coming up at Virgin Media as we start to move our existing customer mailboxes to the Google Apps mail platform (as we announced back in April). Since May all new customers have been provisioned onto the Google platform, and we now have well over six figures in terms of mailboxes on there. Most people are using Webmail rather than client (e.g. Outlook Express) access to their e-mail (with a @virginmedia.com e-mail address) and our fault rates (contacts into our technical support teams) are well within forecast. We have 6 million mailboxes (as customers can have more than one mailbox) to move over from our existing customer base also, and we're starting with the migration of our National (ADSL) customers - who have an e-mail address ending with @virgin.net. Customers with @ntlworld.com and @blueyonder.co.uk e-mail addresses will be migrated to the platform once we have all the National customers onto Google. Since we launched with new customers we have been working on getting ready for the migrations, and now that the test migrations have completed and our staff trials are going well (with really good feedback), we've called a go decision to commence the communications and the migrations will get into full flight over the next few weeks. Great credit and thanks to the fantastic project team of course! Roll on the next few weeks, and we think people will enjoy the new Google functionality. 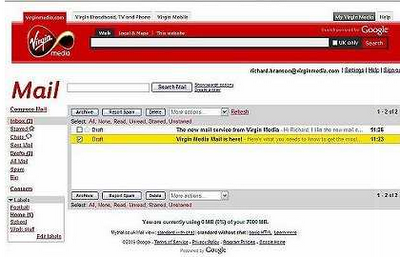 There's lots of help information on our website about Virgin Media Mail (on Google) if people want to read more.